Critical Thinking: What the hell is it? Some people think they are critical thinkers but they are just deluding themselves. There’s nothing critical about the way they think, they just follow along the popular opinion or the spoon-fed “reality” they believe they are a part of. So what gives? Why do they believe they are critical about social issues? Often times, they are part of the problem. They need a swift kick in the head, but they won’t respond well to it if it’s too brass. They need it all sparkly and shiny, pretty and well packaged. On occasion, you might be able to present an idea from a direction they never saw coming. 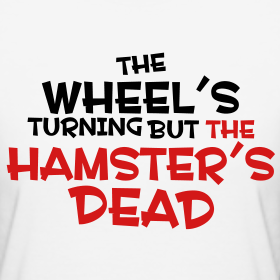 The wheel starts turning, and the hamster that’s running the damn thing has been resuscitated. 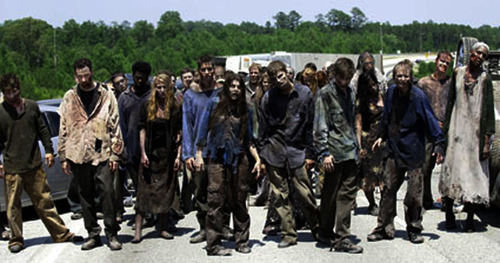 But watch out for that little zombie, it has a tendency to play dead really well. Critical thinking doesn’t always stick, and the Free Thinkers of this world are often coming up with new ways to get people out of the herd. I’m extremely Socratic in my methods, but who the hell wants to be bombarded with a bunch of questions all the time? People stop listening when they become annoyed, so it’s not enough to ask the right questions that seek answers. You can play the Devil’s Advocate without being a nuisance. Critical Thinking has been developed over a couple of thousand years, and involves being intellectually disciplined. It’s not enough to ask questions, you have to evaluate information from a variety of sources. It may be personal observation and experience, or receiving information to be examined closely. It also requires that you reflect on all of this input, and constantly develop your reasoning to discern it. Even then, you’re far from finished. It helps to contrast and compare your conclusions about it with others. Outside perspective is a great way to develop checks and balances for your self. In fact, you can transcend your own conclusions which clarify it, determine relevance, and determine its depth. Which brings me to another matter: Objectivity. How can we subjective beings be objective about anything? This usually means we are being fair about the breadth of said information. This may involve setting our own feelings, experiences and observations aside for a moment to avoid making correlations that simply aren’t there. It’s not as easy as it sounds. People in general, are reactive. Then you have cause and effect playing a role in our reasoning. Say for example a person is being accused of a crime that is sexual in nature. Some sort of sexual assault. If you were to serve on a jury, and had a sexual abuse in your past, can you be objective about the evidence presented in the case? The accusation alone doesn’t prove guilt, each person is innocent until proven guilty by the prosecutor’s case. Right? More and more people are being convicted based on circumstantial evidence, if the litigator can paint the right circumstances to ‘win’ the case, then it is up to the critical thinking jurors to determine if there’s a reasonable amount of doubt to maintain a person’s innocence. In a perfect world… Sadly, jurors are often chosen because of their subjectivity for the Prosecutor’s case, the Defense team is then tasked with finding enough Objective people to give his client a fair trial. Each person hold’s another’s life in their hands when the serve in these ‘Jury by Peers’ cases. Some people don’t care enough to be objective. They just want their jury duty over and done with. Some, can’t think critically and so they make their decisions based on their subjective experiences and observations in the courtroom. How then can the evidence be examined properly to discern guilt or innocence? This is merely one example, but I’m sure you can see the importance here of becoming a critical thinker yourself. Even more so if you were the person that stood accused. You’d have to come up with some pretty awesome strategy to counter the ‘Peer Group’ chosen for you but especially in the absence of critical thinkers among them. Learning Critical Thinking takes personal dedication and discipline. It also takes self-awareness. If a person holds an opinion that YOU are wrong about something, rather than attempting to prove you are RIGHT, maybe you can hear them out and determine what they think you are wrong about. That’s your start-up data. From there, you can address each point a person presents against you. Learning HOW to Learn, is pinnacle in your own thinking skills. The Basic Education system has done a number on ability. The currents of curriculum in Advanced Education aren’t much better. You may need to revel against your own programming to learn new ways to learn. If you don’t think it’s important enough to invest in yourself, I question your value as a person. How valuable are you? If you can answer this without batting an eyelash, you aren’t thinking. You are reacting. Apply Critical Thinking and it may take you a bit longer to answer the question, but most of all you may make a self-realization in that process. Don’t believe in luck? Then BE OF THE DEVIL! This entry was posted in Lucifer, Occult, Satan, Satanism, Sin Jones, Sintristic-Methodology, Yog-sothery and tagged 666, Critical Thinking, Devil's Advocate, Logic, Reasoning, sin jones. Bookmark the permalink.